It didn’t just make it in time for the New York Auto Show it also made its debut in dealerships nationwide: the 2017 Hyundai Santa Fe Sport is here and better than ever. What Makes the New Model Better? First thing is first, the Santa Fe Sport distinguishes itself from the previously released Santa Fe crossover in being a shorter two-row version that’s not only lighter but more agile and fuel efficient than its bigger and older sibling. Right now the Santa Fe Sport is setting itself up to compete with the likes of the Ford Edge, the Jeep Grand Cherokee, and the Volkswagen Touareg. 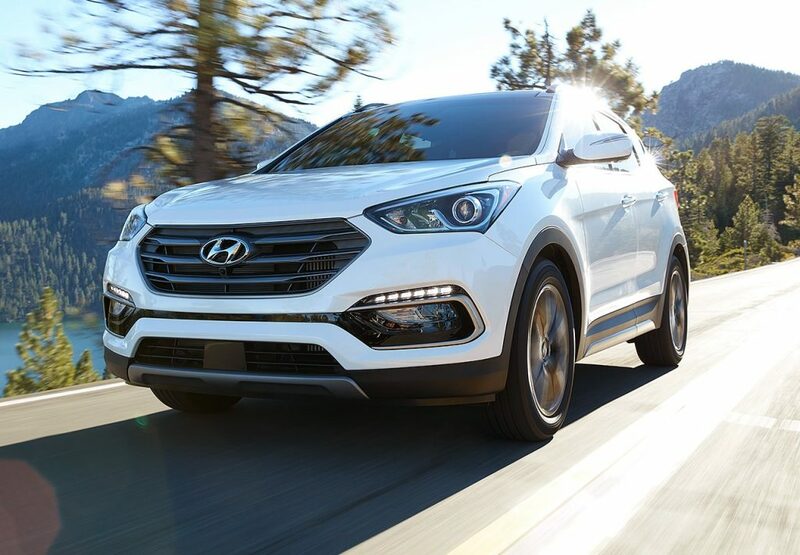 Where Hyundai has the advantage, beyond its unique attributes is that the Santa Fe Sport is the least expensive of that lineup and it still manages to offer a more upscale interior and driving experience. You can argue that the Sport’s rear row is a little too tight for this vehicle class but the model’s fuel economy is anything but underwhelming thanks to that tighter build. And best of all it is more than generous in terms of cargo capacity. While the Ford Explorer is currently outpacing the Santa Fe in US sales it is still very well regarded by trade publications and reviewers. On the surface there’s newly updated front and rear detailing or fascias that accentuate Hyundai’s newly revamped line-wide styling. Many owners will initially notice the new headlight design, which aren’t even just cosmetic, they utilize special high-intensity discharge headlamps in addition to running revised LED daytime running lights and fog lights. The taillights have been changed too with new square-shaped LEDs that compliment the re-styled dual exhaust outlet. Other body updates include the new rocker panel design along the sides. These panels come with unique silver accents that play well with the stock alloy wheels. You may not think this is a dramatic redesign of the Santa Fe’s exterior but it’s a much more modern look to keep it in line with the rest of Hyundai’s 2017 and 2018 vehicles they’ve shown to the press. We’ve mentioned this in the past but the best part about buying a new car these days really is all the options available to you. With the Santa Fe Sport you can decide between its 240-hp turbocharged 2.0-liter four-cylinder engine and the stock 2.4-liter non-turbo four. If the price is right the upgrade gives it some noticeable power. And it’s only the mid-level trim too. If you’re curious about the higher trim level, it gives you an all-wheel drive to add more towing capacity and tighter handling against the elements for an additional $1750.